This is a guest post by Jackie from Craft My Success (This site/resource is no longer available). I have a confession. In the early days of my creative business, I was absolutely fixated with the number of likes my page had. I would actually feel a flutter in my tummy when a new like popped up from “gasp” a stranger! The idea that someone had come across my page, and clicked on the glorious blue button to keep up to date with my business would warm my South London cockney soul. Because as creative ones, we are doubtful of our talents far too much and, for me, every little hike in my “new likes this week” graph was a level of validation for my business. Someone liked my work!!! Crack open the champers and the chocolates! Well, I soon discovered that there are likes…..and then there are LOVES. And that my success depended on focussing on the latter. By “loves” I mean growing a fanbase of genuine potential buyers who love what I create. Too often I see crafters where their 400 likes are mostly made up of nosey work colleagues, supportive family and friends and other crafters. Some of them could cross over and your sister and her friends could be your ideal customers….but to truly have success selling your craft you need to build a network of groupies that do not share the same gene pool. Those are the kinds of likes you desire and screw being fixated on a fake number that doesn’t really mean anything! So how do you spend your online marketing time focussed on growing genuine likes? Every step below is based around the simple premise of eliminating those that are bystanders and reeling in those who are buyers. This one is at the top of the list as it is the quickest fix and so often overlooked. When new visitors land on your biz page you want to be able to grab them from the first millisecond. To do this you need to be super clear with your brand and who your business is for. Do not be afraid to be obvious here. This is the first time many visitors will have seen/heard of you so you want to start your Facebook relationship off on the right foot. Open up your Facebook biz page and try and look at it as an outsider. Or even better, ask someone these questions, who doesn’t currently like your page. Does it clearly show what your page is about and who it is for? Does your cover image show your products? Can visitors clearly identify you from your competitors? Have you studied the branding of your competitors – what can you do to stand out? How can you be memorable with your visuals? Here are 3 examples of craft Facebook biz pages that are dripping like a ice cream in my four year old’s hands with their branding and voice. It is so obvious who they are serving from only just these images. Facebook has groups for every single pocket of society. Every desire, hobby, stage of life, problem and trend has a corner of the Facebook world which is all about them. So what is your ideal customer into? What excites them? What hobbies do they have? What are they passionate about? Try and think outside the box. For example, if I sold scented candles, my ideal customer might be a yoga teacher. So rather than the obvious and finding huge yoga groups to hang out in, I might focus my energy on smaller more intimate pockets such as mindfulness or meditation groups. Big groups move fast and group members do not spend all day in these catching up on what’s been said. Smaller groups will give you an opportunity to really build solid relationships, give great value and be a big fish in a smaller pond. This applies to both your own biz page and posting in groups. To grow your fan base people want connection. They don’t want to be sold to! They want to get to know you. They want to find it out sort of by accident in that kind of “Hey girlfriend, I didn’t know you made gorgeous silver earrings on the side!” way. Get involved in the conversation, start your own posts which are nothing about your makes, provide genuine value. People are nosy by nature and they will check out your personal page (as you will be posting from that) and if you’ve linked it to your business page – hey presto – you’ve found a genuine like! If you can genuinely provide a solution or a suggestion based around your product and you have been engaging prior to that – then go for it! To really maximise Facebook groups, I’d concentrate on a small number to really immerse yourself into and give them at least a month before you exit. If you’re not seeing much from these groups, then move on and test out others. It will take time but 5 mins here and there really builds up. Little and often little and often. Here’s one tip straight from Jackie’s school of “fitting in my business around my family, job and chocolate addiction”: Rather than scanning my own news feed whilst I’m waiting to pick my son up from school, I jump in the groups and see if I can tag along on a conversation. I’ve found from my own experience, by spending time in smaller groups, I have been tagged in posts by strangers when a post has been made around my solution! It is a huge thrill when that happens! Crafter, please don’t make the mistake of thinking that your product does not solve a problem. Your hand knitted kid’s ponchos keep kids warm, whilst having their hands free for play, and solving the “I don’t want to wear a coat” battle most mums have. Your ideal customers need to hear about your features….not your benefits. They don’t really want to know how you made the poncho or where you sourced the wool. Instead they want to know that it will stop them chasing their child around the park hollering “put your coaaaat oooon!!!”. Dig deep when thinking about what problems your products solve and WHY that’s important to your ideal customer. Sometimes it’s as simple as prestige or owning something unique or bespoke. Sometimes it’s knowing that the product is sustainably made and sourced. Once you find the hook it’s sooooo easy to talk to them online and reel them in to your web of seduction. 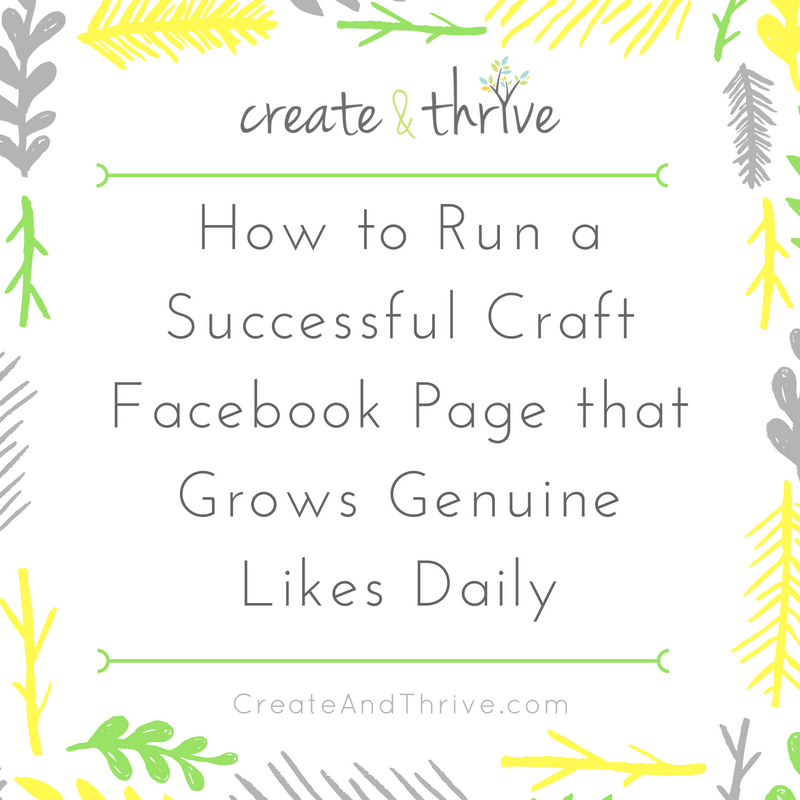 So crafter, I hope this has been helpful for you – go forth and grow your likes in a genuine fashion! I’d love to hear in the comments below what you’re going to action first!